Fun, effective software for stroke & brain‑injury survivors. In addition to a faster recovery, it gives the survivor a sense of independence, accomplishment & motivation. Speech therapists designed it (and tested) specifically for stroke & TBI survivors with no computer experience. And, it's practical as well: you can often get get bonus hours of clinic therapy by shifting drill practice to home. Or, if no therapist is available, use it to continue your progress at home. My dad was so proud that he was able to operate the software. [He] was so excited to show his speech therapist. It was fun for him. Laura the speech therapist really liked the software and is thinking of getting it for herself. If you shift one hour of drill practice a month from clinic to home, that gives your therapist an additional hour to help you. That extra hour would typically cost $100 to $200, so the the software pays for itself several times over while also helping you make faster progress. If therapy has ended we encourage you to find a speech therapist to augment what you do with Bungalow. We understand that many people can't afford that and that's another reason we're here. If you want additional speech therapy, Bungalow often pays for itself by getting you additional hours of therapy in the clinic. If a speech therapist is not available (or you can't afford one) Bungalow is an economical way to continue the recovery you started in speech therapy. We have over 20 different programs to address the unique needs of each patient. They are available as a monthly subscription starting at $39 for our 18 most popular programs (and the first week is a free and includes a money-guarantee. You can also buy individual programs starting at $69 (or in discounted bundles). 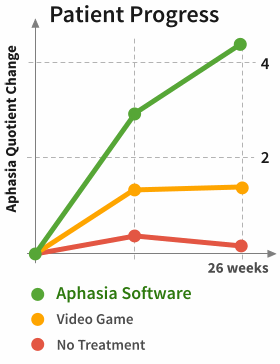 Aphasia Quotient (AQ) is a standardized measure of how significant the Aphasia is as measured by a test such as the Western Aphasia Battery (WAB).